Weak demand and tight credit are contributing to the fall in home prices. Above, trying to sell in Atlanta. 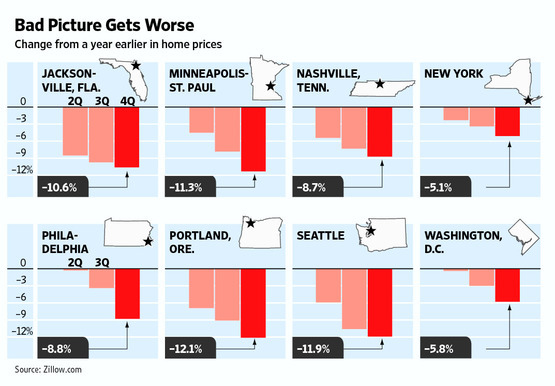 The Wall Street Journal’s latest quarterly survey of housing-market conditions found that prices declined in all of the 28 major metropolitan areas tracked during the fourth quarter when compared to a year earlier. The size of the year-to-year price declines was greater than the previous quarter’s in all but three of the markets, the latest indication that the housing market faces considerable challenges. “There are just not a lot of renters with confidence, with a down payment, with good credit, and without a lot of additional debt,” said John Burns, a homebuilder consultant in Irvine, Calif.
On the inventory front, New York’s Long Island had enough homes on the market at the end of December to last 15 months at the average sales pace. The supply of unsold homes stood at 14 months in Charlotte, N.C., and Nashville, Tenn., and at nearly 13 months for northern New Jersey. “We’re still running at half speed,” said Jeffrey Otteau, president of Otteau Valuation Group, an East Brunswick, N.J., appraisal firm. “Sales are below year-ago levels and inventory is higher than it was a year ago.” Far-flung suburbs continue to fare worse than homes located closer to core metro centers, he says. Economists say that the biggest risk to the housing market is that job growth doesn’t pick up. “Without improvement in unemployment, confidence stays low. 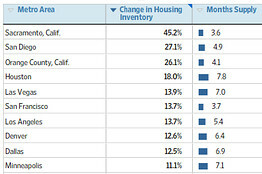 Purchasing stays low,” says Stan Humphries, chief economist at Zillow. That drew two full-price offers, and the home sold last week in an all-cash deal. “The drop in price was critical to reignite urgency for buyers,” said Mr. Klinge.